Keith Curle has asked the Cobblers supporters to trust him and to show patience as he goes about his January transfer window business - and revealed exactly why he keeps his cards so close to his chest when it comes to possible targets. 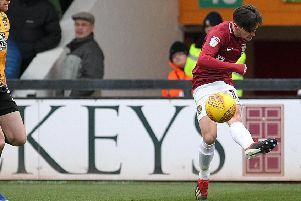 At the halfway point of the window, the exit door at the PTS Academy Stadium has been well used with the Cobblers selling Kevin van Veen and Matt Crooks, loaning out Billy Waters, and cancelling the contracts of loan goalkeeper Lewis Ward and midfielder Yaser Kasim. The only player in through the door to date has been left-sided player George Cox, on loan from Premier League Brighton & Hove Albion, but Curle has confirmed it is his intention to strengthen the squad further. The 55-year-old has also made it clear that he won’t be rushing into deals that aren’t 100 per cent right for the club, and defended the fact he won’t comment on any speculation with regards to players - as it is something that has come back to bite him in the past. “I have done it before, where the press have got wind of a player I have been interested in,” said the Cobblers boss. “It was previously and not here I hasten to add, but they have asked me the question and I wasn’t able to keep a straight enough face. “The next thing, somebody else comes in because I am interested in the player and they didn’t know he was available. “Then, lo and behold, the player decided, because the other club paid him more money, to go and ply his trade with them. “So I am reluctant at this time of the season to identify who the targets are, because if I am looking at somebody there is a reason why. Curle also explained why he has kept his powder dry on making more signings yet, believing patience is the key when it comes to the January window. He also says it is important to resist some players and deals that may look immediately enticing, but perhaps don’t fit in with what is required at the Cobblers. “It is a work in progress with myself, Colin (West, assistant manager), Simon Tracey the head of recruitment, and we have a handle on what we want, and we are brave enough to make decisions on who we want,” said the Town boss. “Just because somebody is available and has played at a higher level, it doesn’t necessarily mean they fit into our jigsaw in the short, medium or long term. and if they don’t, then it doesn’t happen. “Also, the longer you go in the window some players who you thought previously weren’t available, suddenly become available. “The important thing is then that you are able to be in that market to get those players, rather than going out at the beginning of January and bringing in seven or eight players because the window is open. “Then you find you come to the end of the window, a player becomes available that you would like, and you have either over-filled your quota in the changing room or you have no money left. Curle did run the rule over three unnamed trialists in a behind-closed-door friendly on Tuesday afternoon, with the Cobblers losing 2-1 to Peterborough United. Dean Bowditch scored the only goal for Town.